“Ranny” Young barely attended classes at Millikin University for four semesters, yet in 1923 was named by the school’s athletic director as the best all-around athlete he ever coached, and in 1971 was put in the Big Blue athletic hall of fame for football, basketball, and baseball. He only subbed at left end in the first game of the 1920 Staley football season, yet from April 1920 until October 1921 probably had more contact with George Halas than any other player on that team and was warmly welcomed by Papa Bear to the team’s 1956 reunion at Wrigley Field. Young’s family moved from Kansas to Decatur in time for Ranny to attend Decatur High School and excel in sports. He lettered in basketball in 1915, and that fall was on the football team. In 1916 the basketball team did very well in the state tournament led by Young, Wayne Gill, and future Staley teammate Sidney Gepford. However, his best sport was baseball. After graduation, Ranny attended Millikin University along with several of his high school pals but was in and out of school so often it’s difficult to follow his career. He did not play football in the fall of 1917 but did join Gepford in the winter of 1918 and play basketball. The Millidek yearbook stated that he was “another Decatur High star [who] joined the team late in the season, and his speed and accurate basket shooting made him an excellent forward and alternate running guard. We expect great things from him when he has had more practice with the team.” He also joined Kappa Delta Chi fraternity that year along with future Staley teammates Gepford and Roy Adkins. In the spring he pitched for both the JMU varsity as well as for Staley’s amateur baseball club. The 1919 yearbook explained that “Few hitters in the Little Nineteen conference managed to connect with his curves very often. He is a hitting pitcher too, and helped win more than one game with the bat.” On May 30 he pitched three innings of scoreless relief for Staleys in there highly touted exhibition game against Shoeless Joe Jackson and the vaunted Chicago White Sox at Staley Field. Staley lost against that year’s World Series losers 7-4. It would not be the last time that Young would compete with and against infamous “Black Sox” players. 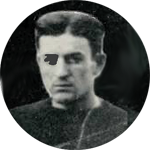 In the fall of 1919, Young excelled at football when his grades allowed him to play as “Ranny was a good man for the forward passing game as he is good at receiving the pass and can hurl the oval with great speed, distance, and accuracy. During the latter part of the season, he accounted for a number of points by his forward passing ability.” He again played basketball that winter as the team won the Little 19 Conference title. However, that was the end of his collegiate playing career as he did not return to classes after spring break and began playing baseball professionally for Staley’s alongside their new star athlete and football coach, George Halas. Young also married fellow Stephen Decatur graduate Cleo Mesnard on May 21, 1920, so having a fulltime job was important. After the Staley baseball season was over Ranny continued to work for Staley and practiced with the new football team. In December he received a $60 bonus for his contributions to the squad. In January 1921 Halas and Young created the short-lived “Decatur Collegians” professional basketball team before getting back to Staley baseball that spring. When the football season rolled around A.E. Staley urged Halas to take the team to Chicago while Young stayed in Decatur and played some independent league football. Still hoping to get into the big leagues, Ranny pitched for the Bloomington, IL team in the “Three-Eye League” in 1922. In October the Millikin alumni helped pay to get him to coach the ends and backs for the university football team. He then stayed on to help coach basketball and baseball before resigning in May 1923 to go back to play for Bloomington. He was rehired at Millikin in September 1923 but again left for another try with Bloomington in 1924. In 1925 he pitched for the Decatur Commodores before being traded to Springfield and then released. In March 1926 he signed to play for Des Moines in the Western League but left to join the Copper Baseball League. This four-team league was sometimes known as the “Outlaw League” because it was a haven for players who had been barred from major league baseball, including players from the 1919 Chicago White Sox who were later accused of throwing the World Series. Young was said to have played with former Sox first baseman “Chick” Gandil as a pitcher for the Fort Bayard “Veterans” in New Mexico. [His manager was Roy “Hardrock” Johnson, Chicago Cubs coach 1935-1954 and Cubs manager for one game in 1944.] After the league disbanded, Ranny moved to El Paso and became a machinist at the Southern Pacific Railroad shops. He kept pitching and coaching amateur baseball and basketball teams into the 1930s before he switched to umpiring. He was well-respected in the El Paso sports community when at age 77 he suffered a massive heart attack and died in the hospital. He was buried at Fort Bliss National Cemetery with full military honors.